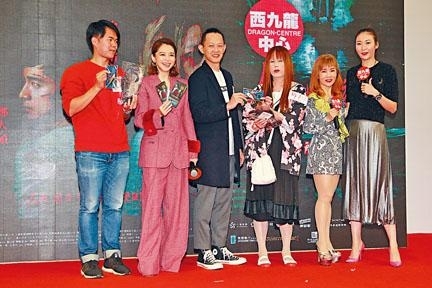 TAG ALONG: DEVIL FISH yesterday promoted in Hong Kong with Vivian Hsu and director David Chuang. They played games with the audience. Vivian Hsu would stay in Hong Kong for three days but due to the tight schedule she could not bring her three year old son with her. She stated that she missed him very much, but as he grew older she could return to work. She would be responsible for her son and would not only focus on work. Vivian Hsu said that she has not appear in Hong Kong for seven years, but she has come for series and commercial work. She said that since she got married she has not been to Hong Kong. Yesterday she passed by Nathan Road and really wanted to go shopping, but she did not have time. She might not even have time to see her friends in Hong Kong. At most they might meet for dinner at the hotel. In TAG she played a divorced mother who was constantly afraid that her son would be taken away, to the point of a mental collapse. Did she have to cry in her performance? She only said that her encounter in the film was not something that an average person would. Everyone would know when they watch the film. However many viewers would be surprised that this horror film would make them cry! Would she come to make a movie in Hong Kong again? Vivian Hsu said, "I really want to come to make a movie in Hong Kong. My child was too young before. At first as a mother I thought the newborn would be the most troublesome, so I was very busy and had a lot to learn. Now my child's teeth are all grown in, childcare still has a lot of lessons but I rather enjoy it. Because I raised my child, he talks a lot and knows how to communicate his feelings. So I can go back to work. Of course I would be responsible for him, I wouldn't just focus on work!" Did she take a salary reduction this time? Vivian Hsu said, "This isn't true. Actors would fight for characters for art. I was able to find a character that was very different from me, but this wasn't true. Money isn't important, the most important is to have a great performance!"